My first high end Spyderco was the Native 5 which I purchased simply for the looks, I love the Jade G-10 and the back lock. Before I even received the knife in the mail I became obsessed with the Para 2 and ordered one. I absolutely love the looks of the Para 2 but as soon as I held it I immediately did not like the way it sat in my hand and have never carried it. The Para 2 just feels big and odd in my hand. Soooo, recently I was lucky enough to grab one of the KC Cruwear Para 3s and it was instantly my EDC. Love love love the Para 3!!!! Now with my addiction in full bloom I'm coveting the Rex 45 Sprint run but just cant reward the peeps online that are flipping them. 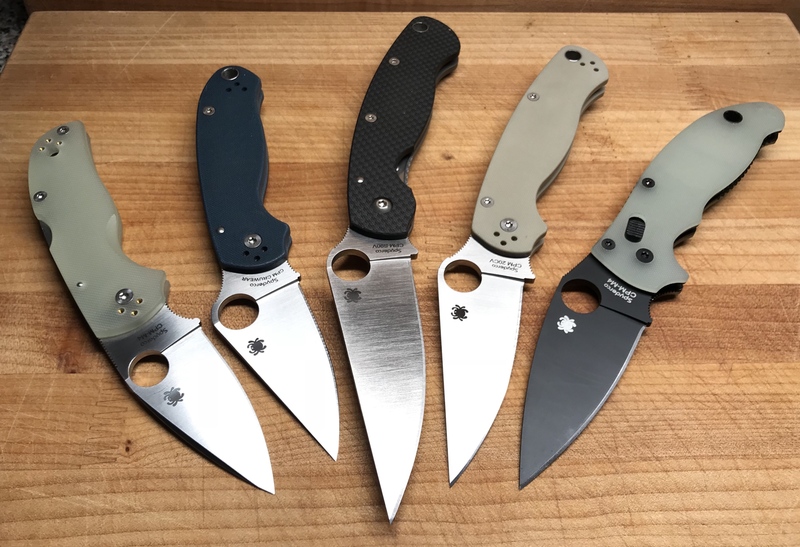 So with the Military Rex 45 and M4 Jade versions still to be released I really want to get one when they drop but I'm afraid that the Military will be like the Para 2 and will be a safe queen because of it's size. Has anyone else felt like the Para 2 was oddly big in their hand but like the way the Military feels? I thought my first Military was a bit big with a bloated handle. There's this thing though that as you use the Military it seems to shrink in your hand. After awhile it seems just right. Got a bunch of them now in different steels. The TiCF S90V Millie wouldn't be the worst knife you could buy. I think the Military and Police are the ideal size for a pocket knife. Most people that buy one end up loving them, even if they think they will be too big. However if you don't use the para 2 due to the size rather than the ergonomics, I can't see things being different with the Millie. I felt the opposite about the Para 2...it's a little smaller than I want so I went up in size. Maybe you could find another model or steel to try out? Are there any other Para 3 sprints that speak to you? Have you tried the Delica yet? People that like Para 3's usually love Delicas too. Some may tell you otherwise, but this is perfectly normal. Just a mild short circuit. Those Golden knives can get you if you're not careful. I'd say that if it gets used at all, it is good to have. I like my Militaries a lot. Can't wait for REX 45. I don't think it's too big and I carry one on weekends, but I usually carry a PM2 or Manix 2 to the office on weekdays. I also carry the Manix 2 XL sometimes. I think the Military is the perfect large folder and my favourite folding Spyder so I’d say buy one, but, if you favour the PM3 over the PM2 … I don’t know. I bought a PM2 first and even though the knife is absolutely perfect in every regard it just doesn’t float my boat. When my first Military arrived I thought it was huge but I put it in my back pocket as advised by one of the members here and that was it. I’ve got one in my back pocket or work bag most days. A few months back I decided to give the PM2 another go and when I opened it I had a little chuckle to myself wondering where the rest of the blade had gone. The Mili is my favorite Spyderco made. The knife fits my hands perfectly, I love the lock, and the blade size and shape is a dream. I don’t like the Para 3 at all. I have 6 of them because I got hooked on the sprints, but I don’t carry them...ever. For me, they are just too small and uncomfortable to use. I have a Manbug on my keychain if I need a smaller knife. If you love the Para 3s, run with it bro. Get some of the cool steels like the 52100 and just try to enjoy the madness! Next, the Military. First my impressions. It is a big knife. I have grown to love it. I had one for a while before I really warmed up to it. It just seemed so huge. But it sure fits in my hand nicely. Now I carry it a lot. The PM2 has always been my standard for "normal". Neither a big nor a little knife. Just right. But that is how it all strikes me. The Manix 2 is the same thing -- it just seems the size a knife should be (to me). It seems odd and bulky folded up, but opened it just fits my hand like magic. Now for you. You say the Para 2 seems oddly big to you. This makes me think it is really unlikely you will find the Military to be anything but really really big. I mean really big, if you get my drift. I love it. but you might well find it big, if you get what I am saying. So, why fight it. If the Para 3 is making your heart sing, run with it. And I like hearing what you say about the Native 5 with the jade scales. That thing is like a little jewel. I'm glad someone else appreciates its magic. Yes indeed. That is a spectacular knife. My second military after the CTS 204P. Those are amazingly different knives for being both Militaries. Both are great knives. I love everything about the Millie,and it fits my hand like a glove even though i have small hands. I am one of the few heretics who don't like the Para,but if you feel the PM2 is too big,you'll find the Millie huge. The PM2 is a tad small for my hand. It is funny because the Delica does well, but that hook on the pommel leaves no place for my little finger to rest. The Military has enough room and so does the Endura (nice design there, but I have to file off the first finger bump). I think the Military will always feel big to most people until you carry and use one enough to adjust to it. If you're used to a Native 5 then yeah the Military is a short sword. If you don't like the large handle of the PM2, it would seem in theory that the Military would be even worse. Too big for me. That's because I still carry the way I've carried for 66 years, loose in my back pocket. The Military is just too big for that and so, for that matter, is the PM2. I generally carry a Stretch, as it's about the biggest knife that rides comfortably back there. I personally hate things in my back pocket but that's only because for years I use to drive all day and anything in my back pockets would make my back hurt or rip my seat. Now it's just habit / ingrained. I'm pretty sure I'll pick up the Sprint Military if I can with hopes that the longer handle somehow make the knife fall in some magical sweat spot in my hand. If not, I'll just feed my addiction with Para 3s... Although I'm liking the Brouwer too. I just wish it had scales on both sides rather than solid Ti scale back. I think I'll be in need of an intervention or more pockets soon!